Does anyone actually “win” in war? It’s hard to believe so, when you see the terrible suffering inflicted on the many innocent families that invariably get caught in the middle of two warring sides. The thick forests of western Cameroon, with the safety of the Nigerian border close by, makes a perfect place for guerilla fighters to hide. The Cameroonian army, in an effort to root out and punish these rebels, has systematically burned down villages in the forested areas, and families are shot if they try to return. Strong youth have gradually been making their way to towns like Kumba or Limbe, but families with small children, the elderly, the infirm… are not strong enough to make the journey. Without their land to grow crops, these families are suffering greatly with little food and no medical care as they hide in fear. We have funded several forays to bring desperately needed aid to the families in hiding, deep in the jungle. It is a journey fraught with dangers. Our first attempt was thwarted by an attack by the government army. Our second attempt was successful, but “E” faced intimidating threats. Several more trips went without incident, but last week “N” was abducted by unknown gunmen as he transported emergency food and medical supplies to the families. He was eventually released and was successful with his mission, but it was a fearful incident. 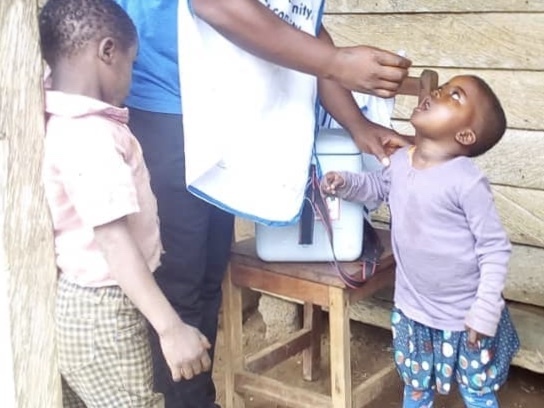 “N” eventually made it to the families in the Toko district where he delivered basic food supplies, performed medical screenings, treated minor health issues, and vaccinated children ages 0-5. Every war has its heroes, and we are partnering with some now. We have the great privilege of being the behind-the-scenes support for these heroes!